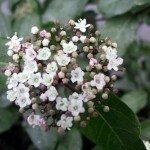 I have viburnum that are 8 to 12 feet tall. I would like to cut them down to 4-6 feet tall and thin them out. What would be the best way to do this? Should I cut them down all at once or cut shoots down to the ground over a few years?